Most people have probably stopped looking back at 2018 by now. I, on the other hand, like A, am engaging in some backward glances to more fully process some of the happenings that have had a lasting impact. 1. It was my first full year lived entirely without caffeine since I moved to this country. How I got through it I know not. Particularly when special needs are factored in, I deserve a damn medal. Send it c/o Radha the Grump, 638 Running on Fumes Way, Soulless Herbal Tea RitualVille, NJ 00000. Make sure there are no cliches on the plaque, kthanks. Tedious phrasing revives a huge longing for caffeine… God, I miss chai. 2. It’s the year I started writing my first book. I’ve been afraid to put it out there, but since I am making progress, I thought I might as well. I am working on a book of short stories. Along with luck, please wish me loads of uninterrupted time and no tech fail. 3. 2018 is the year I finally conquered my fear of driving in unfamiliar places. Yay. It’s been very liberating. Here’s to more interesting drives in 2019. 4. I made it through over a year of mental health help. When I think of all the things we have achieved in this family, I can only be grateful that someone was willing to sit in the fallout shelter with me while I took stock and strove for personal accountability. Thank you to an often irritating but always quickwitted and sometimes kindred spirit who is a credit to his profession. 5. I saved the absolute best for last. The summer of 2018 was when R and his two darling cousins in Michigan taught A to give kisses. He could never get the hang of them before, and would just sort of say “Bah” when asked for one. But now, because they all got together and decided it was a skill worth imparting, he plants the sweetest cheek and hand kisses. They never fail to fill my eyes with happy tears. I waited thirteen years for them, that’s why they mean more. And if God keeps a list of good deeds, these children have surely earned their spiritual gold stars. Purehearts, that’s what they all are. I want to say to my dear readers that your engagement all this while has meant so much to me. 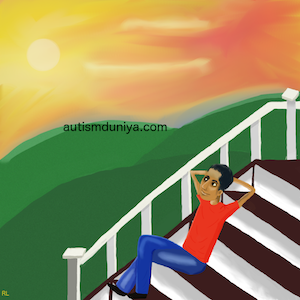 I am almost at three years of writing this blog, and Autism Duniya would not be so rewarding without your support, and thoughtful comments. Writing is my life, and writing about autism is like pulling my soul out of my body. The fact that so many of you understand what it costs me to write on this subject, and that you honor it with your own honesty—it continues to blow me away. Adolescence is pulling a mesmerized A along, like some naughty, irresistible Pied Piper. He sees no reason to resist, and has thrown himself into the experience with his characteristic impish nature. I look to 2019 with equal parts anticipation and WTFery. It sounds like you have a lot worth celebrating! I just found your blog and I am looking forward to reading more and I do wish you loads of time and issue-free tech to continue working on your book. I am assuming the “best for last” is in relation to your child? Forgive my ignorance, as I’ve said, I have only now found your blog. I have written several children’s stories, yet to be published. My writing is confined mostly to my blog as work and home life have been keeping me very busy. In the past I have written for newspapers and magazines and I love photography. Thank you so much, Carol, for reading and giving such thoughtful commentary. I will also accept with gratitude the wishes for my book, and look forward to reading your blog as well. And now you have made me very curious to read your stories! The best for last is indeed about my child with autism. His older brother and their cousins taught the little guy to give kisses. It has really transformed his ability to understand and demonstrate affection. Meanie! Enjoy it, while I drown my sorrows in decaf, you fake friend. LOL! Hello, my friend. This is CLspeaking under another nom de plume. Thank you for allowing me a window into your life – although I no longer enjoy frequent contact with you, I’ve always valued the moments of virtual connection we shared and I count you among the people who enrich my Earth-time allotment – thinking of you always warms my heart. I’m glad we share the same moment in time and only regret that we don’t share the same space on this planet. I would sabotage your best efforts to remain caffeine-free, though! Although my mind is silently screaming “Why? WHY?? ?” when I read about your #1 accomplishment of the past year, (my daily diet consists of two forms of legally prescribed amphetamine daily to jump-start my brain, supplemented by numerous cups of strong tea throughout the day and an Excedrin or two – check the ingredients of that), I acknowledge your success in scaling that particular mountain and send you tons of kudos for all of the challenges and changes you’ve met with courage and grace. My favorite new mental image of you is a quiet scenario – when I think of you now, it will no longer be an image of a lovely woman in brilliantly colored dress performing Indian dances. That mind-picture has been pushed to the background and replaced by a softer image of a mother receiving a gentle kiss on the hand from her beloved son. I am grateful to whatever gods may be responsible for making that scenario a part of your life. A amazing list of achievements ! Wishing you well and success in this year too. Caffeine free!